This is Fred. Fred has a story, a long one, but a must tell, long story. I encourage you to read it, and I encourage you to get tissue because every time I tell it, tears come. We live in the country, real country. We have lots of trees, which in natural bring lots of birds. Most of the time they don't bother me, except when they fly into my windows and I have to clean them up off the yard, but this year we have had soooo many birds. The problem I face is the amount of baby birds that fall from the giant trees. I have a cat, who views this as an easy lunch, and I also have two dogs, which are for some reason very territorial against the birds, even the babies. So I have spent many a day’s cleaning up dead birds. We have many kinds of birds, but they all keep to the same areas of the yard according to species. In the back corner of my yard live the black birds. They are the annoying ones. Every time I go out they dip at me and scream at me and I can't even mow the lawn or sit in that corner of the yard without being attacked. Many baby birds fall out of these trees. 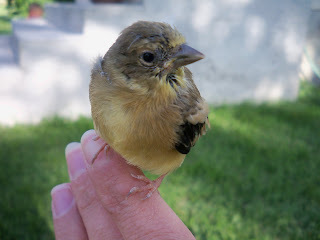 We found one, one day and rescued it before it became lunch, I couldn't very well let it sit on the ground and be eaten while my kids played in the yard, so we scooped it up, ugly looking and all, found its nest and put it back. Next day we found it out again, I repeated the same process, next day same thing. I could tell the little guy was not going to make it, it was just brand new, hungry, and I assumed the reason it kept ending up on the ground was because the mother was kicking it out, after I put it back; I did use gloves. This sort of irked me, but sure enough one morning our little guy was on the ground again and had not survived another fall. Kids were sad. Well, the other side of my yard, yes it's big, I have these really tall trees. We have another species there. Well one day, while playing with the kids I saw my dog attacking something, actually Taylor did and she rushed to rescue it. After coming back from the point of attack, she was holding a cute, tiny little bird. You'll now know him as Fred. We tried to look for Fred's nest, but the branches are so far up, I could see nothing. I knew if she put Fred down, he would be instant play toy for three animals, so for a while she just carried him around. Taylor insisted she be his mother because he no longer had one, and she made him a home. The kids found a box and made a nest in it out of branches grass and leaves. Here she placed Fred. I didn't know what to do with Fred; I certainly didn't want to see him lying on my back porch the next morning, so we put him in his new nest and put him up on top the bunny cage. Fred could not fly, so I knew he would be safe. For the next few days the kids played with Fred. They would lock the dogs up and put him on the grass and try to teach him how to fly, so priceless. Fred spent the majority of his time riding around on Taylor’s finger. He just sat there, held on tight, and chirped at her. I knew we had to find Fred's mom or he would not survive, so I had Brandon climb up the tree with a ladder and check it out. Of course he found nests, but so many, and we couldn't be sure which one was his. I knew Fred had to eat. I told the kids to go find him a worm, and after searching diligently they brought me a big fat one. Conner reminded us that baby birds usually eat from their mothers’ mouth after she chews up the food for them, nice. I was very firm on the fact that I was NOT going to do this, so Taylor insisted she break up the worm into tiny pieces and try to feed him. Fred would not eat. We tried several times and then some more the next day. He finally took a small bite, but nothing to sustain himself I'm sure. Poor Fred, I feared the worst for him and I knew this one would be hard because he was Taylor's little finger buddy. 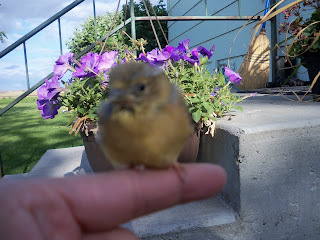 Of all the birds, he has been the only one to sit on our fingers and talk to us. After sitting in the yard debating what we should do, Brandon brought to my attention a very small yellow bird that kept flying over us, but then flying away. After I thought about it, I thought, could it be? Could this be his mother? I mean it is so noisy in my yard I can't tell who the birds are talking to, but there was only one way to tell. The kids put the animals in the house and we placed Fred at the bottom of a small lone tree and then huddled on the swing to watch. At first the Yellow bird would fly to the tree then fly away immediately, but I had hopes because this lone tree never housed any birds, it was too small, and too low to the ground. Fred slept for a while and the bird repeated this same process only each time staying a little longer. 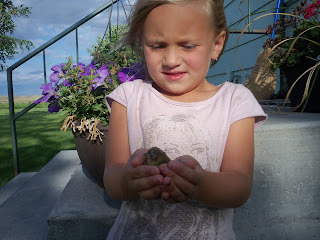 We kept absolutely still because each time we moved the bird would fly away. Soon Fred began to cry, and then so did I because with each cry the yellow bird came closer and closer until finally it landed on the ground next to Fred. Immediately Fred became ballistic and the yellow bird was consoling him. Fred found his mom. Then we watched her fly back to the trees and return with food for Fred. He ate for a while. Now this story doesn't end here, and the next half is what truly got me thinking. Being a bird and being on the ground is a dangerous thing, and after I saw the mother fly away I thought, “stupid mother, can't just leave him there." She would fly around him then come back, then fly up in the air then circle back, soon she discovered he could not fly, which I am now convinced that is what she was trying to get him to do, follow her. As we continued to watch, the mother would fly away then come back and land on an object. Then she'd talk. Then Fred would hop over to where his mother was. Then she would fly away again and then come back landing somewhere different, not too far from the last place. Then Fred would hop some more. I thought, “This is cute, but dumb. Where is she taking him?" They continued this ritual all the way back to one of those tall trees in the back yard. Fred then parked it at the base of the tree. The mother kept trying to get him to fly, but Fred could not fly. It brought tears to my eyes to see this mother watching her baby from a distance, and then coming back for him and helping him home. At this point I knew we could not just let Fred sit on the ground at the bottom of the tree. So we put him in his box and lodged the box in the tree just below the other nests, hoping when his mother heard his cries she would take care of him there. After the kids went out to check on him the next morning, Fred was still in his box. A couple days went by and we kept an eye on Fred, but tried to leave him alone. One day we came out to check on Fred and he was not in his box. Upon searching for some time we could not find Fred. A day went by, then one afternoon while out in the grass pile, Brandon found Fred, alone, alive, and hiding in some weeds. Poor Fred is trying so hard to fly, but just can't. We put Fred back in the box. I just could not bear to leave him down for free food. Several more days went by and sometimes when we would find Fred had fallen out of the box, we would also find his mother nearby, watching him. I just hoped she would keep watching him. One morning Fred was not in the box and nowhere to be found. We looked everywhere. Most of the baby birds had been flying for some time now, and they all look so alike, it was so hard to tell. But we believe Fred finally flew away. His mother was no longer flying around the ground watching him, and so far we have had no surprises on our porch. The kids were sad at first, but little Taylor was so excited after I told her I thought he finally learned to fly. She said, “So now he can be with his mommy in the trees!" Yes, I am convinced Fred is with his mommy in the trees. It was sweet to see a mother watch her baby, come for her baby, feed him, and help him hop home. Regardless of the fact that Fred could not fly, his mother was still there. She still took him home. So why was the other bird left to die each time he fell out of the nest? And why was he being kicked out of the nest? I don't know. I have thought a lot about Fred, and his mom. No matter what species you are, being a mother is a special job. If one of my babies fell from the tree, I would watch them, I wouldn't stop looking until I found them, I would comfort and feed them, and if they could not fly I would help them hop home. We love Fred, we are grateful for the lessons he taught us and the experiences he gave us, and we always look for his wings among the trees. I now love Fred too!! What a cute story, and a great learning lesson for you and your kids. wow... publish it, it's a winner! I'm with Korbi - that story is cool! !